On July 15, 2017, at approximately 4:21 p.m., Dallas Police responded to a shooting call in the 35oo block of Roberts Avenue. Upon officers arrival, they found the victim, Wyshawn Gaddy a 41-year-old Black male, deceased from a gunshot wound. Through the course of investigation, it was determined that Jerry Raymond Riedel a 64-year-old White male, was responsible for the victim’s death. 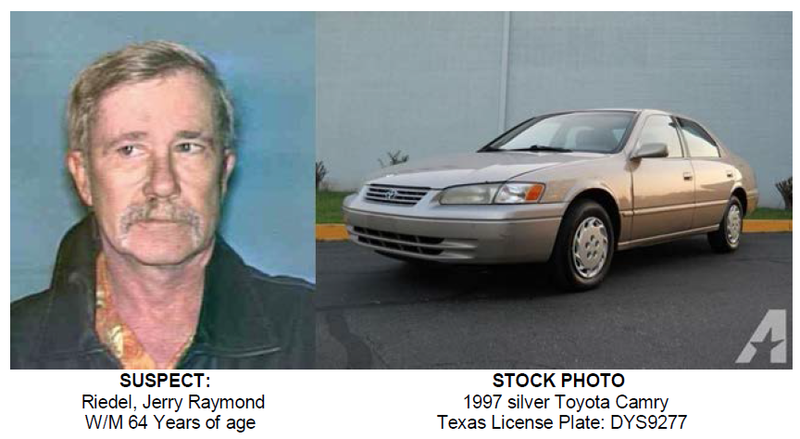 An arrest warrant has been issued for Jerry Raymond Riedel. This offense is documented on case number 160944-2017. Crime Stoppers will pay up to $5000.00 for information called into Crime Stoppers that leads to the arrest and indictment for this felony offense and any other felony offense. Call Crime Stoppers at (214) 373-TIPS, 24 hours a day, 7 days a week.